Allergies occur when your body’s immune system mistakenly views one or more common foreign substances as an invader. Although these substances are usually harmless, your body produces larger amounts of histamine in response to the perceived threat, which triggers symptoms such as a runny or stuffy nose, sneezing and post nasal drip. In some cases, allergies are seasonal, which means they occur in certain times of the year. Spring allergies are common, and they’re often triggered by substances such as tree or grass pollen. You may suspect that you have seasonal allergies if you develop symptoms only during certain times of the year. The presence of a seasonal allergy can be confirmed with an allergy test. This allows a doctor to prick your skin using tiny amounts of potential allergens to see if you react to any of them, and if so, which ones. Vacuum your home: Use a vacuum cleaner with a HEPA filter to clean your floors, rugs, and furniture. Use your clothes dryer: Don’t hang your clothes outside to dry, since pollen can accumulate on them. Change your clothes when you get home: After you’ve been outside, your clothes may have pollen on them. Shower before bed: This washes allergens off of your hair and face so you don’t transfer them to your pillow. Close your windows and doors: Keep the windows and doors in your home as well as your car shut. Wear a mask: When you’re mowing or doing other yard work, wear a NIOSH-rated 95 filter mask. Watch out for mold: Mold in your home is another common spring allergy, and it can result from leaks in pipes, windows, or roofs. Check these areas and repair and seal them as needed. Change your air conditioning filter: Change it at the beginning of the season and frequently thereafter, and consider switching to a high-efficiency grade filter. Plan your outdoor schedule: Peak pollen counts usually occur between 5-10 a.m., so if you’re planning an outdoor activity, try to schedule it outside these hours. 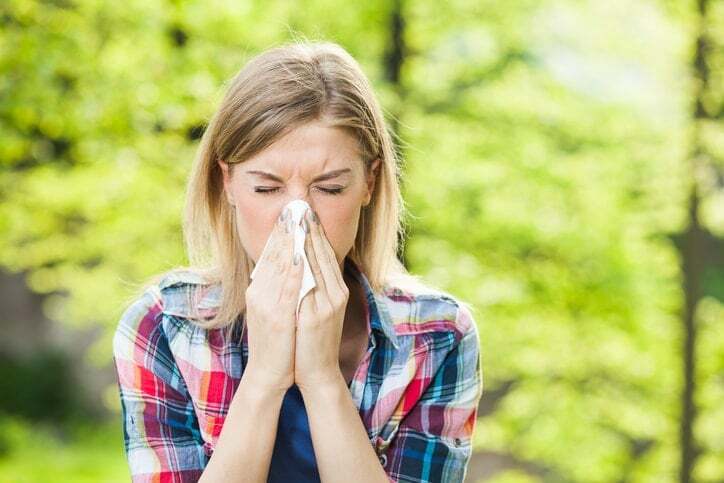 What are some common treatment options for seasonal allergies? If you suspect you suffer from spring allergies, contact us today for a consultation with Park Avenue Medical Professionals in NYC. We’ll diagnose the cause of your symptoms and recommend the most effective forms of prevention and treatment. Fill out the form on this page to request an appointment or call 212.427.2000 to learn more.